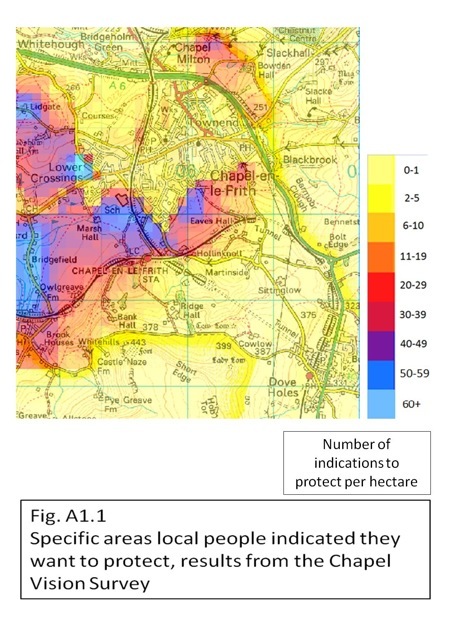 Areas of Special Countryside in Chapel-en-le Frith Parish: Special Countryside, AMES Areas of Primary Sensitivity, Special Landscape Areas, Local Green Space, Special Country Lanes. In response to a question in the Chapel Vision Survey 270 people suggested specific green spaces that they regarded as particularly special and wanted to protect from development. The areas they nominated were numerous and widely distributed across the Parish, some in the built up area and some in the countryside, mainly outside the Peak District National Park. 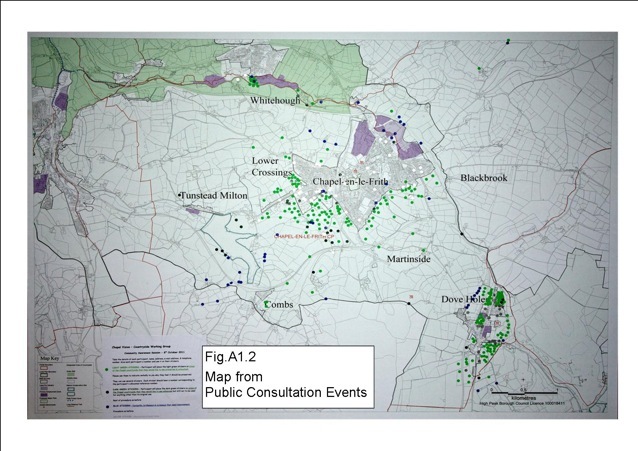 A large sample (approx 50%) of the comments and areas mapped by the respondents have been combined, to show on a map the areas of countryside that local people want to protect, see Fig A1.1. The reasons they gave for wanting to protect these areas were mainly the quality of the views, walks and wildlife. Fig A1.1 was derived by placing a transparent grid, consisting of 40 X 50 squares each representing an area of 1 hectare, over maps drawn by respondents in reply to the survey. The areas drawn by each respondent were then transferred to a similar array of cells in a Microsoft Excel spreadsheet. Simple Excel algorithms added the results to determine the total number of respondents nominating each square. In most cases the respondents indicated the areas they wanted to protect by written comments rather than a map. In those cases a map was drawn to represent their comments and the same procedure was then applied. This procedure was repeated for the 50% sample of responses and the results were doubled to represent the density of nominations per hectare for each square over the whole survey. 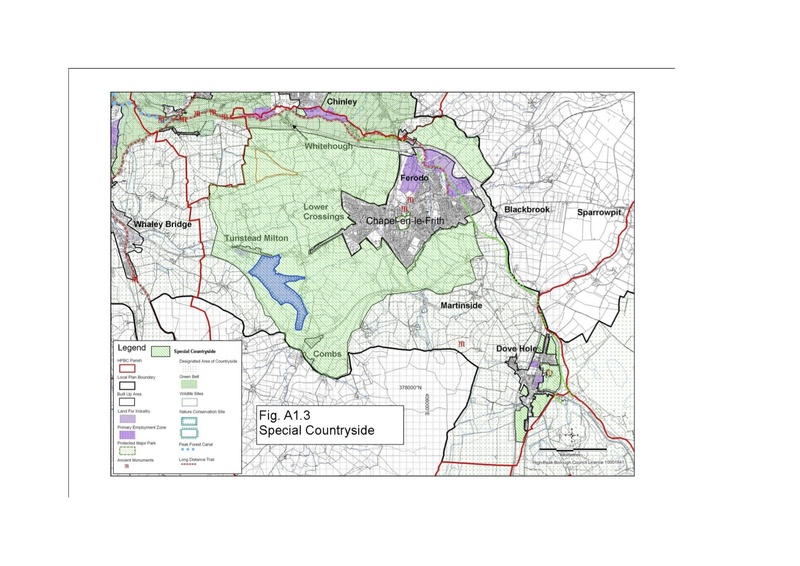 The Special Countryside area lies mainly within the area of the Parish that was designated as valley pasture in the Peak National Park Authority’s landscape character assessment (see Fig.A1.6). This area has its own distinct character and abundant wildlife. It also tends to be flatter land that provides more accessible and easier walking than the steeper areas of the Parish. It is highly visible from the nearby hills, making it an important part of the setting of the Peak District National Park that surrounds it. 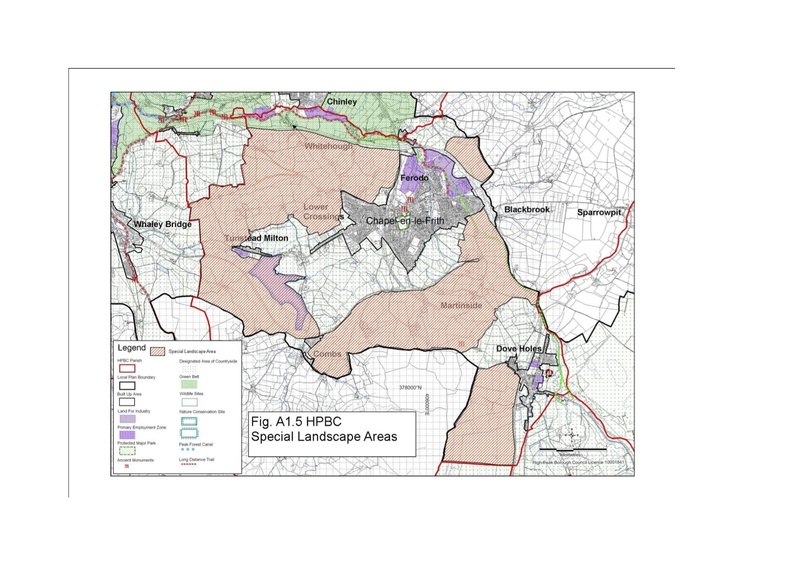 Derbyshire County Council’s, Areas of Multiple Environmental Sensitivity (AMES) study examined the combined visual, ecological and historic aspects of the sensitivity to development of landscape areas throughout Derbyshire. 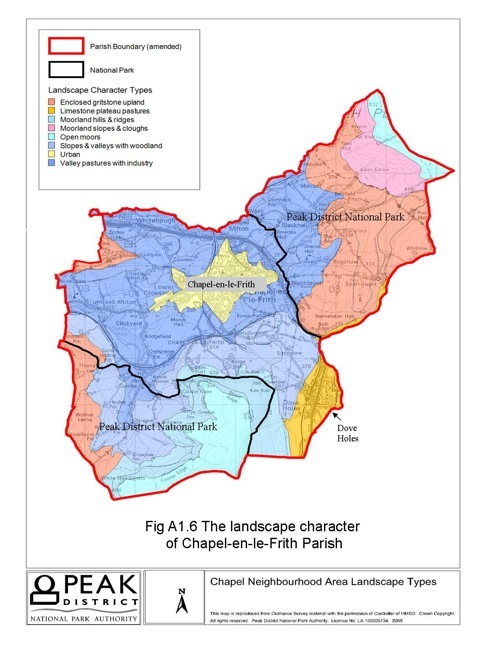 Only a tiny fraction of the High Peak District was identified as being of Primary Sensitivity and that area of Primary Sensitivity lies mainly within Chapel-en-le-Frith Parish (see Fig A1.4). Combining the Special Countryside area (Fig A1.3) with the area of Primary Sensitivity identified by the AMES study (Fig A1.4) and the Special Landscape Areas previously established by HPBC (Fig A1.5) shows that almost all of the countryside outside the built up areas of the Parish has been identified as special, most of it by independent expert opinion. A second approach was also employed in analysing the comments made by respondents to the Chapel Vision survey question that asked them in to identify special green spaces in or close to their town or village. The number of people suggesting the same place by name was counted, using a Microsoft Excel algorithm and also, separately, by two volunteers who read all of the comments. The results confirmed the peak densities recorded in Fig A1.1. Volunteers with good local knowledge then studied the most frequently mentioned areas and identified spaces within those areas that they considered special and to be consistent with the criteria given in the National Planning Policy Framework (NPPF) for Local Green Space designation. The spaces the local volunteers identified are listed in Table A1. Other green spaces within the built up area, including those owned or controlled by the Parish Council were added to the list. After preliminary consultation with an officer of High Peak Borough Council and review by the Chapel Vision Countryside Group and Chapel Vision Steering Committee, some of the places listed in Table A 1 were considered to be suitable for proposal for Local Green Space designation and they are listed Table 1 in the Draft Neighbourhood Plan. Other spaces were considered more suitable for alternative designations and they are listed separately in the Neighbourhood Plan (Table2). In replies to the Chapel Vision survey some people indicated that they wanted to protect areas around particular country lanes. To accommodate their wishes some lanes in the Parish are described here as Special Country Lanes. Those particular Special Country Lanes (Table A1) also have links to the network of footpaths in the Parish and potential to provide links to the Greenways network, 2. Evidence is available, including comments and in some cases photographs produced by local people in support of the green space proposals and nominations for Local Green Space designation that were eventually excluded from the Neighbourhood Plan. Information and reasons why those spaces were not included in the plan will be provided in Appendix AE1. Definition of Special Country Lane : A lane in the countryside that is special to local people for its character, beauty, tranquillity, wildlife, views , walking , cycling or horse riding.